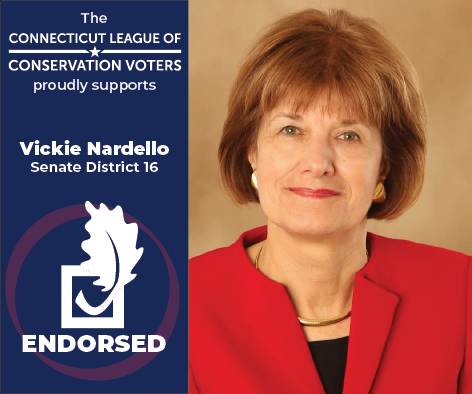 The Connecticut League of Conservation Voters (CTLCV)—a bipartisan organization dedicated to protecting our environment by making it a priority for our elected leaders—endorsed Vickie Nardello (D) to represent the 16th Senate District. Nardello previously represented the 89th House District until 2013, where she maintained a 97% Lifetime Score in CTLCV’s Environmental Scorecard. A strong advocate for clean energy, Nardello helped create the Connecticut Green Bank, our nation’s first bank dedicated to investing in clean energy projects. Her commitment to clean energy is a sharp contrast to her opponent, Sen. Rob Sampson, who has an abysmal 31% Environmental Score. With the latest report from the United Nation saying we only have 10 years to cut emissions and act on climate change, we need leaders like Vickie Nardello who are committed to this fight. Her work to establish the Connecticut Green Bank and promote renewable energy make her the clear choice to lead our efforts to reduce emissions and combat climate change. Vickie also signed our Clean Energy for All pledge, vowing to move Connecticut to 100% clean energy by 2050 or sooner. With Trump in the White House, we know we can't rely on Washington to cut our emissions. Instead, Trump pulled out of the Paris Climate Accords, slashed clean car standards, and put polluters and coal lobbyists at the head of the EPA. We need leaders like Vickie here in Connecticut to make sure we stand a chance at fighting climate change, cutting our emissions, and creating new jobs in clean energy. Paid for by CTLCV PAC. This message was made independent of any candidate or political party. Contributions to the CTLCV PAC of $5,000 or more were made by CTLCV, Inc.; LCV, Inc.; and David Bingham.